To set the standard for excellence in direct energy investments. build long term income from oil and natural gas production. Involves a high degree of risk and is only suitable for qualified investors. We have a long history of earning your trust. From the beginning, our goal has been to earn lifelong relationships with our clients. To achieve that goal, we have always sought to provide full disclosure, transparency, fair dealing and exceptional service. Our clients have rewarded us with a powerful and gratifying loyalty. Repeat investors fund approximately 90 percent of every project. In fact, many have been investing with us for more than 10 years. We believe giving back to the local community is part of being a responsible corporate citizen. The Saint Vincent DePaul Society runs a dining facility called St. Vinnie’s Bistro in the Prospects Courtyard at the Haven for Hope Homeless Shelter. Here are some pictures from last years event. Here is a link to FINRA Broker Check. Experience and expertise you can depend on. At Champion, our people are our greatest assets. 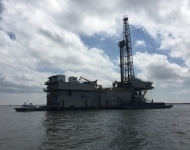 Our owners bring you 50+ years of combined investment experience in the oil and gas industry. We strive to be a model of ethics in the oil and gas direct investments sector. For more than twenty years, Champion has endeavored to provide exceptional energy investment services. We are committed to practicing full disclosure-representing features, benefits and risks equally and honestly. Over the years, we've raised hundreds of millions of dollars for energy projects and strived to maintain a steadfast commitment to the highest ethical standards. NEW YORK (Reuters) - Oil prices rose about 1 percent on Friday, posting their biggest quarterly rise in a decade, as U.S. sanctions against Iran and Venezuela as well as OPEC-led supply cuts overshadowed concerns over a slowing global economy. Saudi Arabia expects to reduce oil output once again in February and pump for six months at levels “well below” the production limit it accepted under OPEC’s oil-cuts accord, Energy Minister Khalid Al-Falih said. China initially rejected a U.S. request to choke off the flow of petrodollars to Iran but, amid intense pressure from the Trump administration, China is now reportedly taking steps to comply. Choosing the correct energy investment partner. Your exclusive agent for Combined Resources Group (CRG). We believe Combined Resources Group (CRG), an affiliate of Champion Group, has been one of the most active sponsors of oil and gas drilling partnerships in the U.S. since 1986.